Perceiving Taste. Or, Why Eating Chocolate Will Never Be the Same Again. Home / News / Perceiving Taste. Or, Why Eating Chocolate Will Never Be the Same Again. So began an evening of taste, trials and triangulations. Our small Providence office was bursting with the New England local community, as well as a coterie from A&E Roastery, Dave’s Coffee, Bolt Coffee and New Harvest Coffee Roasters. 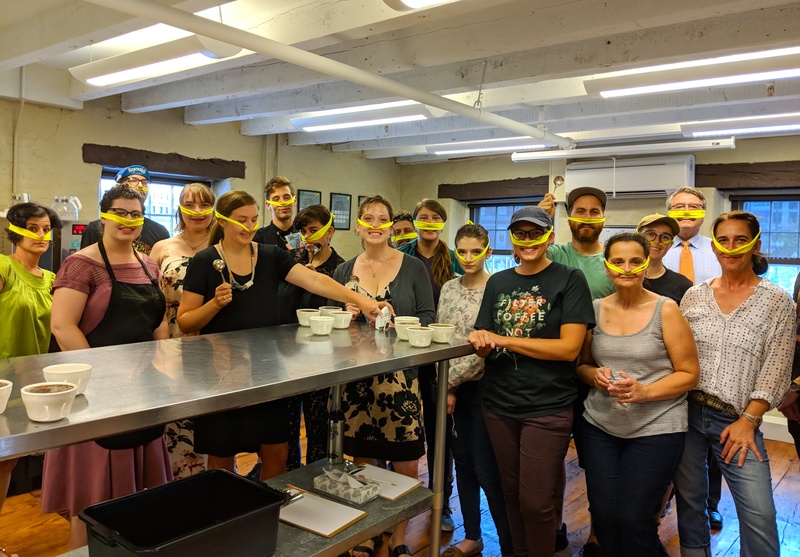 Perceiving Taste, the third event in Providence’s Summer Sensory Series, was designed to challenge, puzzle and delight the taste buds. Amanda began the evening with a short lecture on the science of taste. 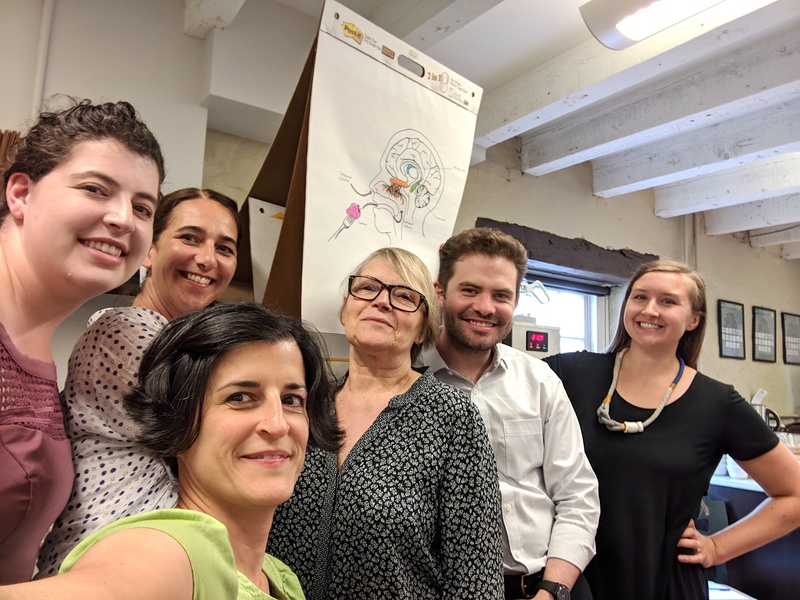 We learned about the chemical receptors that convey taste and smell to the limbic system, which also deals with emotions and survival instincts, as well as memory. 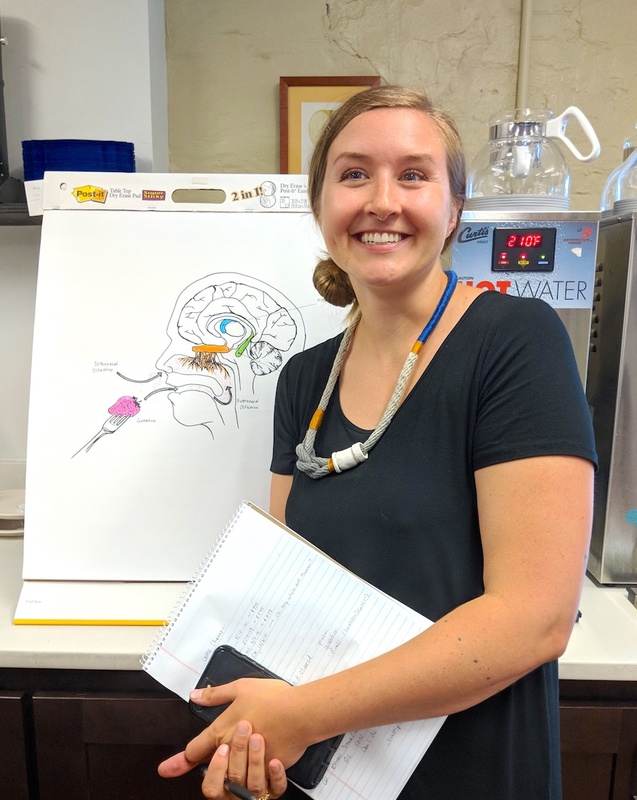 Amanda Armbrust-Asselin, InterAmerican Quality Control coordinator, standing beside her hand-draw poster of the brain’s responses to a person eating a strawberry. “It’s easy to see the evolutionary benefit of having pleasure and fear immediately linked to perceptions without memory recall,” Amanda told us. Eating bitter or sour foods (which could be poisonous or rotten) immediately evoke instincts to spit, grimace or choke, signaling to ourselves and others that these foods are not fit to eat. Perhaps most fascinating to learn was that visual, auditory and tactile information do no pass through the limbic system. This means that perception is a collaboration of sensory and cognitive inputs. And yet perception is, in fact, often illusory. We don’t feel wetness, but instead a combination of temperature, pressure and texture, which merge to give us the sensation of wetness. Likewise, hot or spicy is not a taste, but a “pain signal sent by nerves that transmit touch and temperature,” Amanda shared. Moving on to the second of the senses, we experienced touch as each person received three cups filled with orange juice at different temperatures—cold, room temperature and hot. We discussed the variations of mouthfeel. One person remarked that the warmer orange juices tasted more buttery and viscous with higher acidity, while the cold juice was more refreshing and sweeter. In the third activity, we tested our sight. Three plastic cups of colored liquid—one yellow, one pink and one green—were set before each person. Asked to order them from sweetest to least sweet, everyone tasted each liquid and worked to determine the level of sweetness. 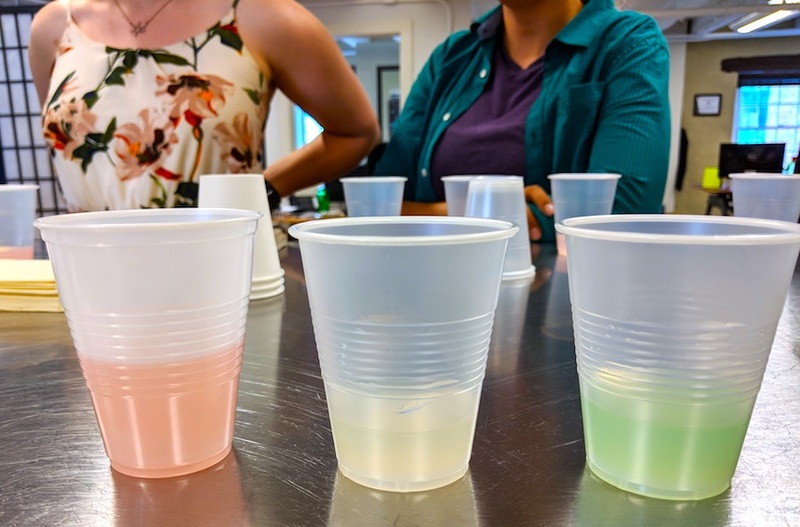 This activity was based off a study that determined that even when the green liquid was sweeter than the pink, people perceived the pink liquid as sweeter, because of the color. No, it is not possible for a group to look more lovely wearing "nose blinds"— i.e., an "airhorn for your sense of smell." We dove back into the world of coffee with a triangulation for the fourth exercise, challenging smell. Asked to find the odd cup out, people sniffed and slurped their ways to the correct answer. But, in a twist, we were asked to perform the triangulation a second time (with the same coffees) using “nose blinds”—a special, IAC original made with neon-yellow strips of fabric sprayed with sweet-orange oil. “An airhorn for your sense of smell,” as Amanda called them, the nose blinds eliminated smell and retro-nasal experiences during cupping, which made determining the odd-cup-out more difficult. Someone observed that without a sense of smell, they could only discern bitterness and acidity in the cup. Much of the complexity of the coffees disappeared without the ability to use smell. As the evening came to a close, we finished with a cupping of organic acids to challenge our sense of taste. Four acids—malic, citric, phosphoric and acetic—were used to amplify a cup of anemic coffee. Citric was bright and juicy and malic tasted like an apple, while acetic smelled like vinegar when hot and phosphoric left a chalky sensation on the tongue. Victoria Brown is the QC Intern at IAC’s Providence office. While new to the world of coffee, she studied food history and food policy at Sarah Lawrence College. In her spare time she enjoys reading, knitting, drawing and cooking. Her full portfolio can be found at: https://www.clippings.me/victoriaabrown.